At the start of your course, your driving instructor will give you a copy of the Pass Plus pupils guide. Then it will take at least 6 hours, though it can take longer if we think it’s necessary. Pass Plus is a practical course & all modules should be practical sessions. However, local conditions & time of year may mean that some modules need to be given as a theory session. A theory session could be given if there is no motorway nearby. We will complete a training report form. To pass the Pass Plus course you’ll need to reach a satisfactory standard in all 6 course modules. Once passed all 6 modules your Pass Plus certificate will be sent to you. What is Pass Plus course? Pass Plus is a DSA approved training course aimed at the 17 – 30 years. Designed to be taken after passing your L-Test. You will learn how to deal with various challenges that you may not have encountered during your pre-test lessons. Thereby helping you to be a safer, more confident driver. Newly qualified drivers are much more vulnerable than they realise. Statistics show that new drivers are more likely to have an accident within the first two years after passing their driving test, than at any other time in their driving career. A quarter of those killed on the roads are under 21 years old. 95% of RTA’s are caused by human error, and the new driver’s comparative lack of experience often leads to these errors. Reduce their risk of being involved in an accident. In addition to their broader range of skills, greater confidence and reduced accident risk, all major insurance companies will offer a substantial discount on the cost of their insurance policies. This is usually in the area of 30% (similar to having a no-claims bonus, but in their first year of driving!) For example that is £100 off a £500 premium. Many pupils benefit even more. Our fee for taking Pass Plus is £150 wever, in light of the importance and success of the Pass Plus course several local authorities are helping pupils with the cost of the course. Some boroughs, town, city or county councils offer discounts up to 30% full tuition costs. You’ve nothing to lose! So should this be of interest, then I will give full details of schemes in your area on application. 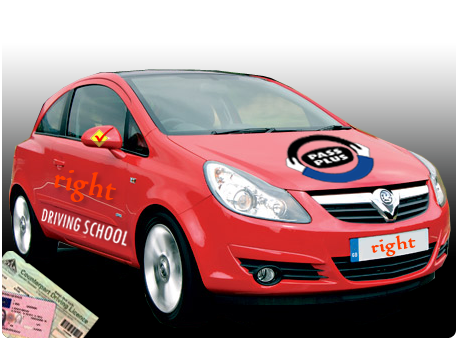 Are you looking for a reliable driving school in Central London? Look no further! Right driving in Central London has top quality driving instructors who are all DSA approved. Right driving schools in Central London have fantastic introductory discounts on driving lessons, and block booking discounts may be available.